Mushrooms mixed with parmesan, oregano and extra virgin olive oil and served on crusty garlic toasts. These simple mushroom toasts make a great, easy and tasty appetizer or snack. Drizzle each side of bread with olive oil and toast on a hot griddle until toasted and charred on both sides. Whilst still hot rub the top side of each slice with the clove of garlic making sure to cover all the way to the edges. Clean any dirt on the mushrooms with a damp paper towel and finely slice. Add 1 tbsp of olive oil to a large frying pan and add the mushrooms. When the mushrooms start to wilt down, add the oregano and a good pinch of salt and pepper. Continue to fry the mushrooms until cooked through (about 5-10 minutes). Spoon the mushrooms into a bowl and add the grated parmesan, stir to combine. 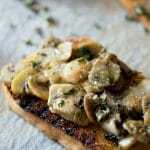 Top the garlic toasts with the mushroom mixture and serve.